Steve Hillage has long been a fixture on the psych/space rock scene. At the age of 17, he fronted the band Uriel, and a year later, under the name Arzachal, they recorded their sole album, the original vinyl of which is a much sought after collector’s item. While the first side showed off some competent blues based psychedelic songs, it was side two that propelled the band into space rock history with the 17-minute freak out, Metempsychosis. Picking up where Pink Floyd’s Interstellar Overdrive left off, this journey into inner and outer space laid the groundwork for much space rock to come. In 1971, Hillage formed the band Khan and released the album Space Shanty, which delved deeper into more progressive psych directions. But in 1973, Hillage returned to space rock when he joined the hippie musical collective Gong and recorded and toured with them throughout the course of their seminal Radio Gnome Invisible trilogy, again laying the groundwork for much space rock to come with classic tracks such as Master Builder, The Isle of Everywhere and A Sprinkling of Clouds (the latter of which Ozric Tentacles have said was one of the templates for the creation of their sound). It was in Gong that Hillage met his soon to be lifelong partner Miquette Giraudy, and together the two of them have continued to forge new musical directions with classic 70’s psych/space albums like Fish Rising and Green to the highly influential late 70’s ambient work Rainbow Dome Musick, and onwards into the 90’s and beyond with their explorations of atmospheric guitar fuelled ambient techno. 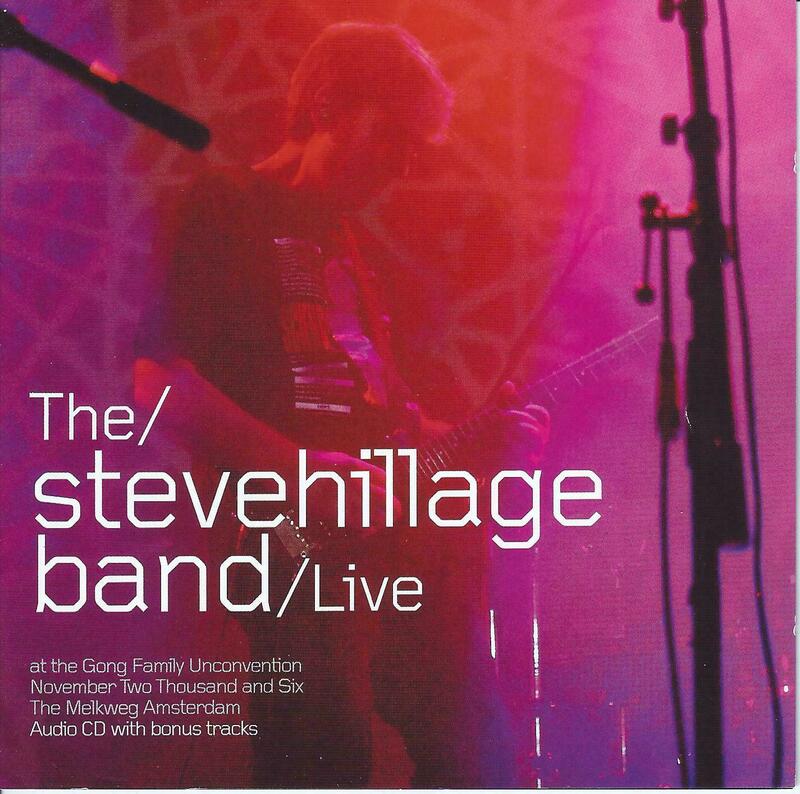 In 2006, Hillage and Giraudy were invited to join the Gong Family Unconvention by reforming The Steve Hillage Band, which had not played live in 18 years. Despite the long hiatus, the resulting show was a magical journey into the space rock past, brilliantly captured on both CD and DVD in this package (a re-issue from 2010). The line-up includes Hillage and Giraudy, as well as Mike Howlett (from Steve’s classic Gong days) on bass, Chris Taylor (from latter day Gong line-ups) on drums, and Basil Brooks (of both Zorch and the original Steve Hillage band) on additional synths. Hillage seems a little bit bemused at first, as if he had just awakened to have magically found himself standing on a stage back in 1977. Fittingly, the band opens with Hello Dawn, a bouncy psych/folk rocker from the ’77 album Motivation Radio. They then launch into Hillage’s spacey synth rock version of the old George Harrison penned Beatles tune It’s All Too Much. The band seems confident, even inspired. And then they really start to catch fire with a both spacier and heavier version of Aftaglid, originally from the Fish Rising album. With an extended, trippy delay guitar opening blasting into a heavy, eastern inspired jam with Giraudy’s liquid cosmic synths bubbling around everything, this is a space rock classic, and one of the highlights of the show. No doubt pleasing fans of his early music, Hillage and company continue to explore the Fish Rising album, with a mostly mellow take on the epic Solar Musick Suite Part 1 (which nonetheless features some of Steve’s most searing guitar work of the show). It should be pointed out here that Steve Hillage is a vastly underrated guitarist, in my personal opinion. You don’t ever see him appearing on any top 100 guitarists of all time lists (I’m looking at you, Rolling Stone! ), but he should be. He works those frets like there’s no tomorrow (including the famous glissando guitar technique developed by Daevid Allen and perfected by Hillage), but like Hendrix, he is also a master of effects pedals, blending delay, flanging, fuzz and wah wah, with ease and brilliance, into a seamlessly integrated guitar style. It is really a shame that he has not gained more recognition. Anyway, back to show! After another dip in the Fish Rising ocean with The Salmon Song, Hillage surprises with a song never before performed live. These Uncharted Lands was the original opening cut from the mostly forgotten 1982 album For to Next. Hampered by synth driven 80’s style sounds and a more new wave, less electric gypsy kind of outlook, the album is not regarded as one of Steve’s classic works. But here, free of its 80’s production, These Uncharted Realms shines as a beautiful, mellow trip into infinity, enabled greatly by an extended, spacey cosmic jam that wasn’t part of the original studio version. A blissed out end to a great show. The DVD of the concert is well shot, and its use of psychedelic effects, tasteful and trippy. There’s also some split screen and overlay techniques used to show close ups of the musician’s fingers on their instruments without losing the overall big picture of the band playing. The CD and DVD both come with different bonuses. In the case of the DVD, it’s half an hour of insightful interviews with Steve and Miquette which also include some behind the scenes look at the preparations for the show. The CD includes 4 bonus tracks, all vintage live performances from the 1970’s. The beautiful Palm Trees (one of my all-time favourite Steve Hillage songs), along with Unzipping the Zype and Healing Feeling are all from a 1979 performance in Amsterdam. But the real treat here (for Gong fans, anyway), is an early live version of the Solar Musick Suite performed by Gong in London on October 6, 1974. It’s quite different than the version that would ultimately turn up on Fish Rising, utilizing Gong’s signature space/jazz/rock approach, with Didier Malherbe a standout, contributing lots of smouldering, squonking sax (an instrument not used on the final studio version from Fish Rising). One of the things that struck me about listening to the 2006 performance back to back with the 1979 performances was how seamlessly they fit together. It’s almost as if the years between had dissolved, and the Steve Hillage band had never gone away. Let’s hope we don’t have to wait another 18 years to hear from them again!